Renowned as a tonic that enhances vitality and lifts mood, damiana is thought to have aphrodisiac qualities that stimulate libido in men and women. An effective dose consists of 4-20 grams of dried plant material. A coldwater infusion may be prepared by soaking the plant material in water and filtrate the solution after 24 hours. A damiana brew may be prepared by boiling the plant material in water for one hour and then filtrate the solution. Damiana can be started from seed and should be planted in sterile seed starting medium with gentle bottom heat. Lightly cover the seeds and keep moist until germination. Damiana seeds may take some time to germinate so be patient. Room temperature for growing seedlings should be about 70F (21C). Transplant seedlings after they have two sets of true leaves into 3-4 inch pots filled with a light potting medium. 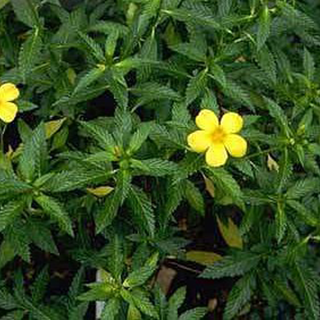 The Damiana plant is usually harvested during the warm summer months about the time it starts to bloom. The leaves are then left to dry before they are used.